I'm working on reviews and giveaways for the Book Giveaway Carnival and taking a break from the "Full to the Brim" posts this week. Please refer to the Carnival for some great book giveaways and don't forget to enter my contests! 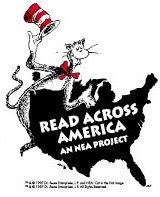 Did you know today is Dr. Seuss's birthday and also the NEA's Read Across America event? Visit the site for free digital read-along versions of Dr. Seuss books (via kidthing) and other resources. Additionally, visit http://www.seussville.com to enter the Happy Birthday to You! Sweepstakes! and win a trip for four (4) to Universal Orlando® Resort. (Contest period runs January 27, 2009 and April 1, 2009).